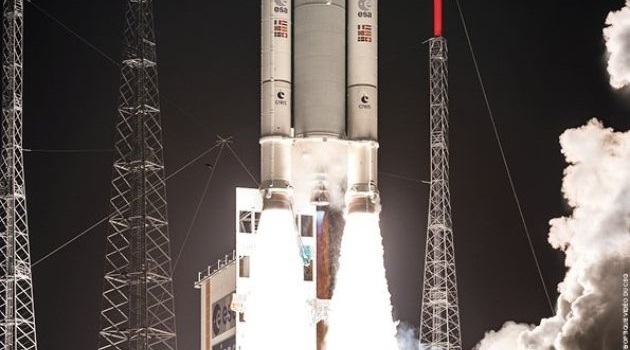 All events leading up to Ariane’s post-sunset liftoff at 22:20 UTC appeared by the book and the same could be said for the initial climb-out of the rocket, riding on pillars of fire and smoke as Ariane 5 pierced into the night sky with a thrust north of 1,400 metric-ton force. 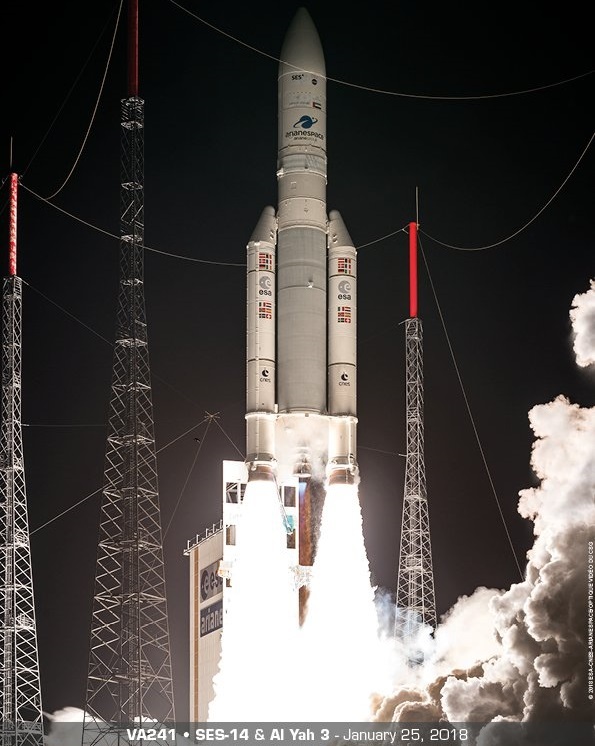 Mission VA241 was tasked with deploying the SES 14 and Al Yah 3 communications satellites into a Supersynchronous Transfer Orbit, taking advantage of surplus performance as Ariane 5 was “only” carrying a payload upmass of 9,123 Kilograms vs. its demonstrated GTO capacity of 10.8 metric tons. All appeared to be proceeding smoothly as Ariane 5 disappeared into the night sky and the Range Operations Manager at the Jupiter Control Room was calling out nominal performance parameters as the launcher reached key mission events – dropping its boosters at T+2 minutes and 19 seconds, separating the fairing at T+3:18 and handing from the large cryogenic first stage to the ESC-A second stage at the T+9-minute mark for the final push into orbit. However, Mission Control went silent just half a minute into the second stage’s planned 16-minute burn when signals from the vehicle unexpectedly vanished. At the time, Ariane 5 was 195 Kilometers in altitude and traveling 7.02 Kilometers per second – still short of orbit. Communications with Ariane 5 were not regained for the remainder of its planned 35-minute mission and the mood at the Jupiter Mission Control Center turned from tense to desperate when nothing was heard from the satellites immediately after their anticipated separation from the Ariane 5 second stage. 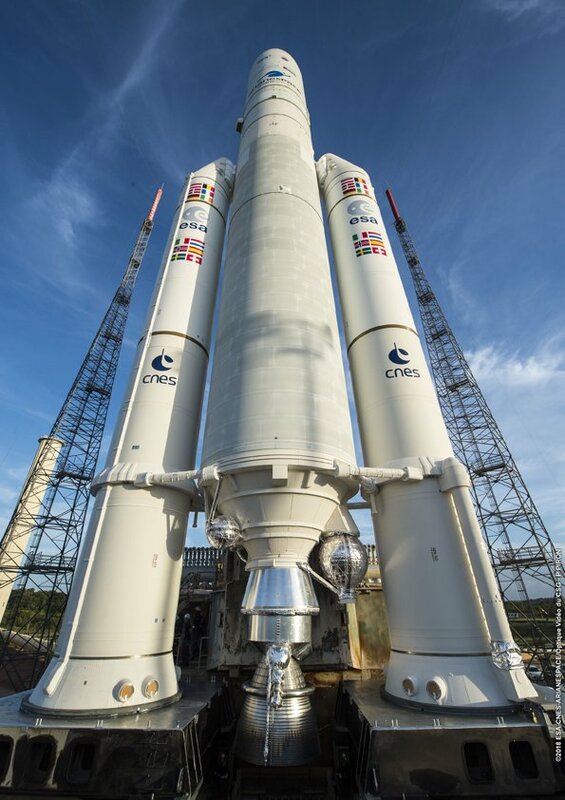 The good news eventually coming from the payloads riding atop Ariane 5 is that both are alive, in a stable but off-nominal orbit and expected to reach their operational positions with manageable losses of service life. Satellite operators SES and YahSat confirmed in the overnight hours that both satellites had been acquired by ground stations and both were shown in a stabilized configuration after separation from the Ariane 5 launch vehicle. VA241 was targeting an orbit of 250 by 45,000 Kilometers at an inclination of 3.0 degrees. The achieved orbit shows a very large deviation of inclination while the perigee and apogee are fairly close to their target – ruling out any significant performance hits encountered on the way uphill which had been the initial suspicion after reports of a non-compliant orbit emerged Thursday night. Propagation of the orbital parameters back to the time of orbital injection (22:44:46 UTC on Jan 25) shows Ariane 5 achieved orbit some 600 Kilometers above Botswana, Africa – roughly 2,000 Kilometers south of where orbital injection was expected. Flying considerably south of its planned trajectory, Ariane released its two passengers just on the edge of the visibility zone of their respective ground stations, explaining 2+ hour delay in confirming both were alive as they had to climb in altitude to become visible to tracking stations called up for their mission. 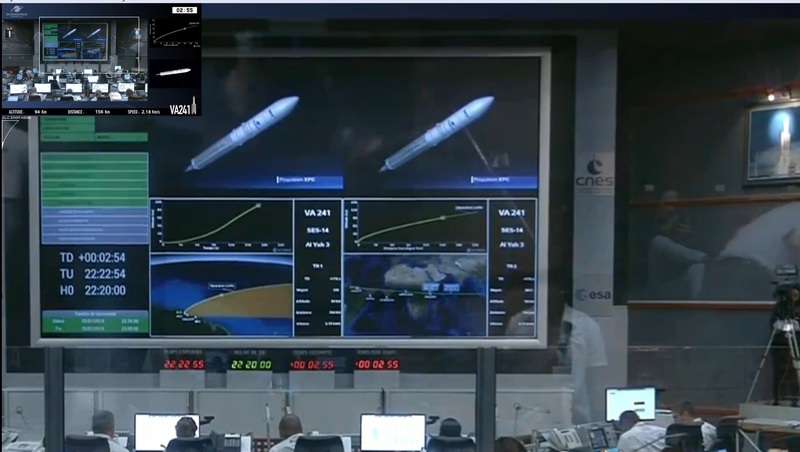 Arianespace did not go into detail on when in the flight the trajectory deviation manifested but a major clue appears to be available in the launch broadcast provided by the company. A tracking map of the launch vehicle – based on live telemetry coming from Ariane 5 – clearly shows the vehicle flying south of its planned launch azimuth, beginning in the very early portion of the flight. 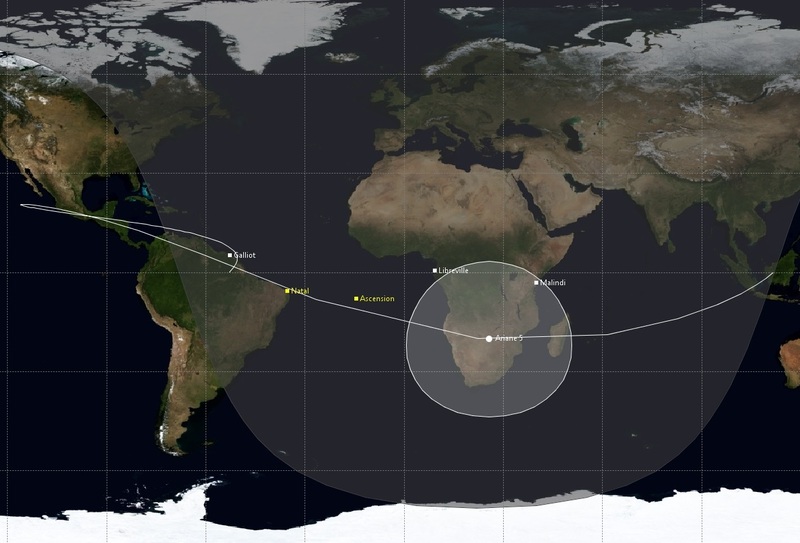 Based on the trajectory map, VA241 was to follow an azimuth of ~92 degrees (in-line with previous Ariane 5 missions; straight east at 90° according to the EAP impact area) but the actual azimuth is shown on the map to be around 111 degrees (in agreement with the 21° orbit). The initial flight azimuth may have been even higher according to video of Ariane’s initial climb-out and pitch-over which could raise additional questions as the investigation continues. 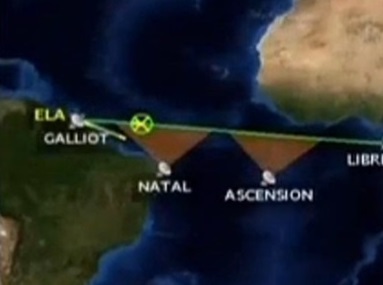 This flight path took the vehicle much closer to the South American coast line than planned, but Ariane 5 did not to pass over land downrange from the launch site (nor did its Instantaneous Impact Point IIP pass over Brazil) and vehicle performance (in terms of propulsion & vehicle stabilization) appeared to be nominal – providing a possible explanation for the lack of range safety action in the form of a destruct command from the CNES-operated range. Range Safety, with the notable exception of Russia & China, typically operates under firm rules that guide the termination of a flight. These criteria obviously include the trajectory of the rocket, the IIP, the status of insight into launch vehicle telemetry, and the performance of the vehicle itself. Whether any of these criteria were violated on Thursday is impossible to judge from the data available at the moment, especially for the very early portion of the flight where video clearly shows Ariane 5 essentially passing directly over spectators watching from a public area. The loss of data after stage separation likely came after the hands-off point for range controllers. 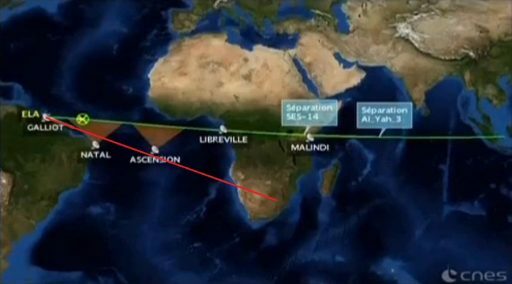 It is entirely possible (and very much indicated by video evidence) that Ariane 5 attained the improper azimuth as part of its initial roll and pitch maneuvers in progress from T+12 to T+32 seconds that were to align the vehicle with its due easterly launch path. An improper azimuth setting from the get go would also explain why the mission did not suffer a major performance shortfall with respect to injection speed and resulting orbital parameters. Curiously, a brief video segment showing the main display at Jupiter from T+2:41 to T+2:55 includes a three-dimensional representation of the rocket’s ascent path (lower left) which had the vehicle on the proper trajectory on its way toward fairing separation. Another view of the same screen around T+5:45 showed two maps – a close-up of the ground track on the left and a view of the complete mission ground track on the right. The close-up shows the cursor right on the planned trajectory – raising doubts as to whether this represented actual flight data since the map provided directly through Arianespace’s webcast clearly showed the deviation by that point. One peculiarity evident in the tracking map occurred just before the T+8-minute mark when the cursor depicting the actual position of the vehicle suddenly jumped from the ~111° azimuth onto the proper trajectory. This coincided with the planned acquisition of signal from the Natal Tracking Station in Brazil and, considering the alignment between orbital inclination & azimuth, appears to be a spurious data artifact (or the result of changing data population at different stages of flight). Another fairly bizarre element of Thursday’s mission was the handling of the situation by Arianespace Public Affairs as well as mission officials at the Jupiter Control Center. The Range Operations Director continued reporting nominal onboard parameters through the burn of the first stage (which was true since performance was indeed nominal), but a glance toward a telemetry or radar-tracking-based map would have made what was happening obvious immediately. Finger-pointing and nervous looks eventually started some eight minutes into the flight and the off-nominal situation appeared to become apparent to most managers present when signals were unexpectedly lost – with the notable exception of public affairs on the Webcast Commentary and the official Ariane Group Twitter account who kept sticking to the script until around 33 minutes into the flight. Moving forward, Arianespace “has set up an independent enquiry commission in conjunction with ESA” to fully investigate the circumstances of the anomaly. 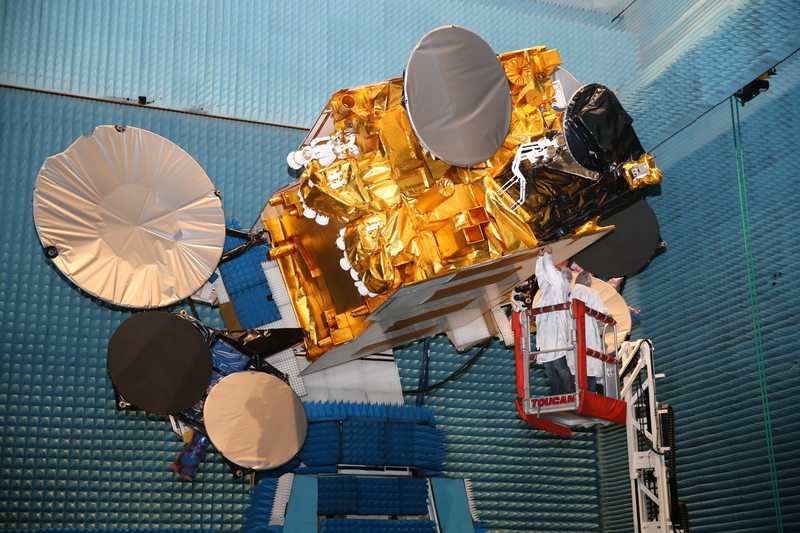 The company also said that current launch campaigns underway at the Guiana Space Center will proceed as scheduled, hinting toward a quick completion of the investigation, possibly through the results obtained through initial quick-look data. For the two satellites, their mission will be impacted by their off-nominal target orbit but permanent damage seems to have been avoided. 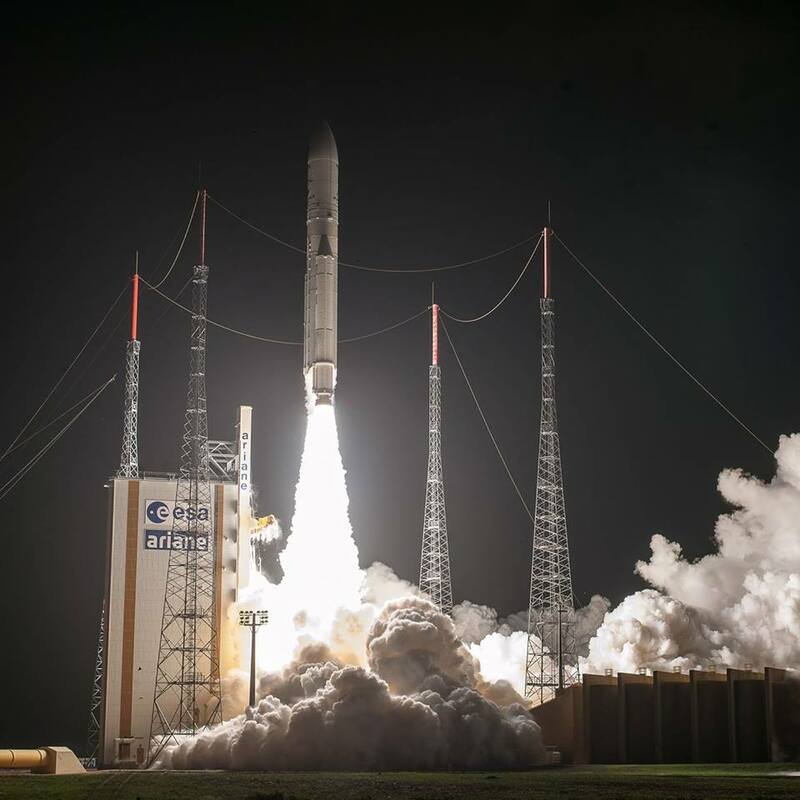 Based on the orbital parameters provided by JSpOC, the off-nominal injection by Ariane 5 came with an additional requirement of 166m/s for each of the satellites to correct inclination and bring up the perigee. In addition, the satellites have to rotate their orbits since their perigee/apogee locations moved away from the equator due to Ariane’s improper ascent path. As both satellites have electric propulsion, they should be able to make up for the shortfall – coming at the cost of additional time needed to arrive on station. Al Yah 3, the first Orbital ATK GEOStar-3 satellite to reach orbit, will likely lead the way via a series of firings of its BT-4 bi-propellant main engine to rapidly bring up the perigee and reduce inclination to reach a near-GEO orbit followed by several weeks or months of orbit topping using its XR-5 hall current thrusters. SES 14, using the all-electric Eurostar-3000EOR platform of Airbus, will need around four weeks longer to make it into the operational orbit, employing its advanced ion thrusters for the entirety of the transition.